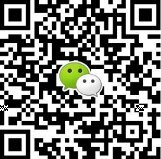 We collected some of the best foreign creative sources in Shanghai on graffiti artist, pattern designer,branding designer, interior designer ,fashion designer and visual merchandiser!Welcome to contact us to know more…..
We also showcase interesting and high quality suppliers and brands from local and all over the world. Apple has never shied away from an ambitious project. That drive recently helped the tech giant become the first U.S. company to be worth $1 trillion and also pushes Apple architecturally. Case in point: Apple Michigan Avenue, the new pure glass flagship in the Windy City. 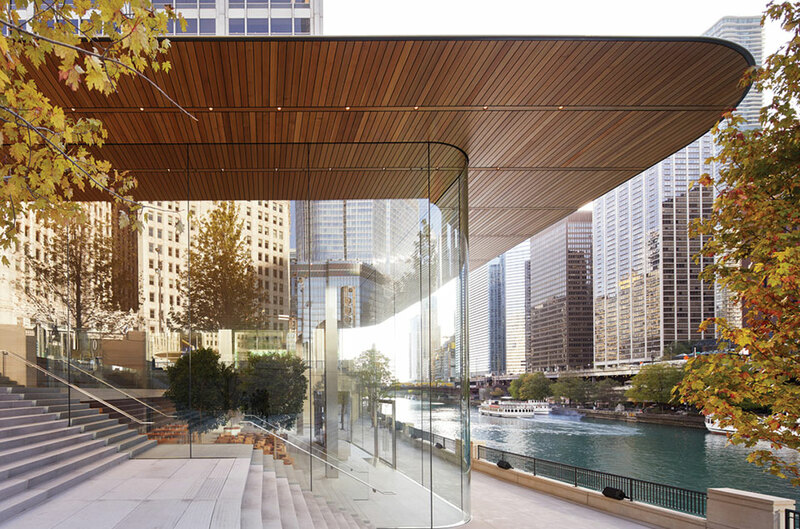 Apple collaborated with architect firm Foster + Partners, as well as the city of Chicago, to reference historical records to develop a store design specifically for the site on which it sits. The transparent and light-filled space connects the Chicago River, Pioneer Court and North Michigan Avenue’s Magnificent Mile. The store is sheltered by a 111-ft.-by-98-ft. carbon-fiber roof, supported by slender stainless-steel columns and features 32-ft. glass façades, which means unobscured views. It also touts Apple’s latest retail store concept, Town Square, offering seating space dedicated to creativity, education and entertainment, and geared toward community building. 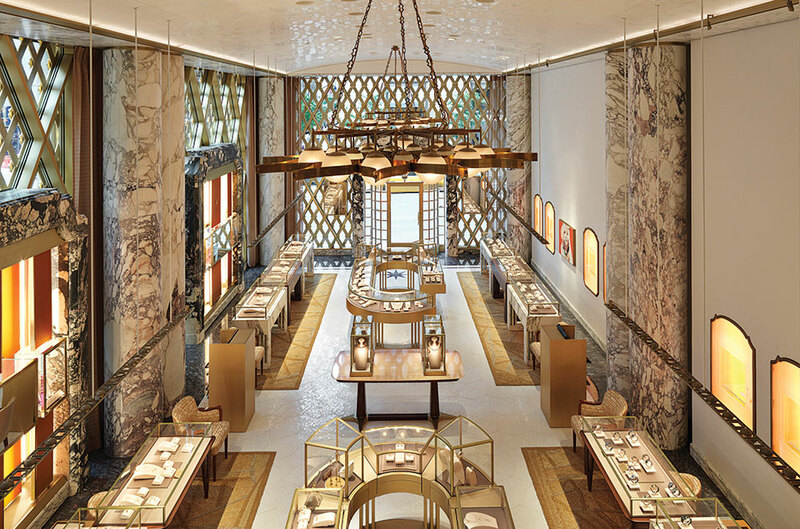 The redesign of Bulgari’s Fifth Avenue flagship has been a long time coming. Originally opened in 1989, the Manhattan location occupies the outer façade of the Crown Building, on the corner of Fifth Avenue and 57th Street. The flagship renovation further instills the brand’s commitment to the luxury retail experience. Led by visionary architect Peter Marino, the design is strongly influenced by the original Bulgari flagship on Via Condotti in Rome, beginning with a replica of Condotti’s iconic door, which dates back to the 1930s. Its exterior resembles the clasp of one of its heritage bracelets. Inside, more than 30 materials—from marbles and walnut to brass metals and silks—were incorporated to bring Rome to Manhattan. While Everlane may have budged on its original idea to never do stores (never say never! ), it has not swayed on its aesthetic. 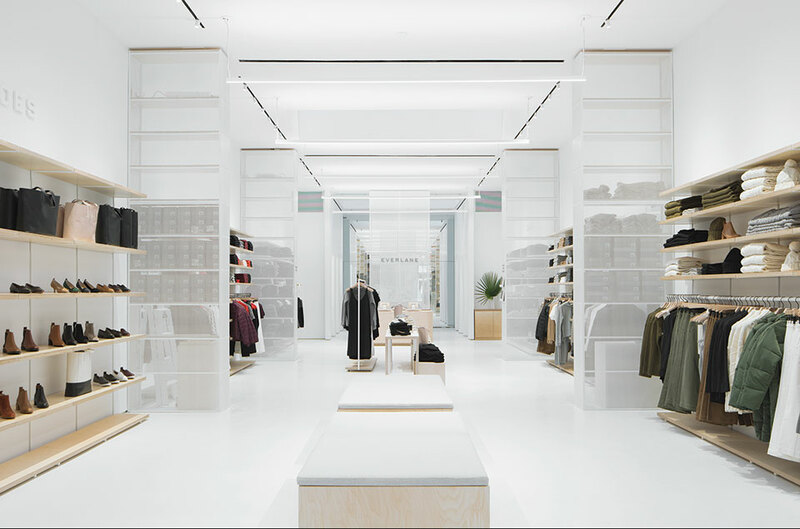 Teaming up with New York design agency Leong Leong, Everlane had to make sure its first physical store, located in Nolita at 28 Prince St., mirrored its minimalistic brand and online store, and embodied its sense of community. With high ceilings, giant skylights and a crisp palette consisting of white and natural wood, the 2,000-sq.-ft. store is bright and airy. There are few decorative items other than educational signs that explain the brand’s commitment to transparency and information about its partnered factories. The 100-percent glass storefront, furnished with stadium seating, further instills the brand’s mission to merge commerce with community. 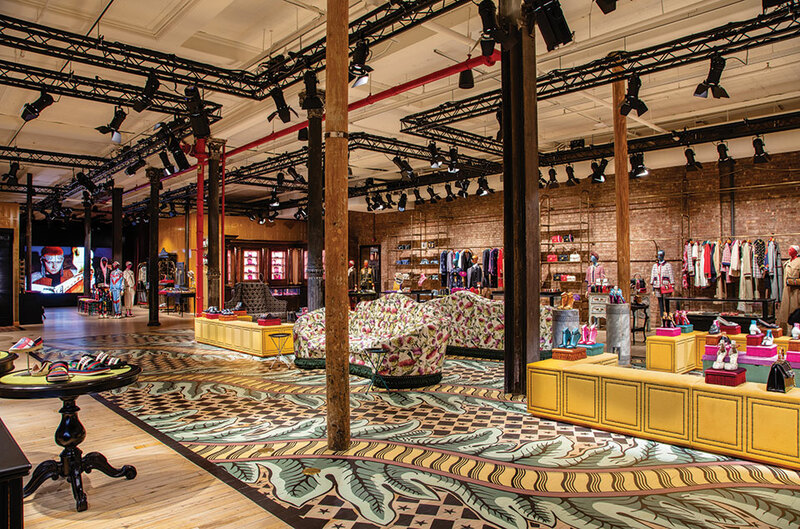 Gucci’s latest retail experience is far from the predictable trappings of luxury shopping. The retail brand opened its first SoHo location in New York, inhabiting a full city block, from Wooster Street to West Broadway. Aptly named Gucci Wooster, the 10,000-sq.-ft. space occupies a 155-year-old landmark-protected building. It’s a mix of old and new world: the brickwork, wooden floors and tin ceiling are restored. The floor, handpainted by Italian artisans, introduces color and pattern. Video installations and an interactive LED wall bring in the bright lights and experiential treatment. Sofas dot the center of the space, allowing for easy admiration of the merchandise. Together, all of these bells and whistles help connect the customer to the brand and tell the Gucci story in their unique ways. Hershey’s Chocolate World is a treat for all the senses, not just taste. The new flagship store is armed with 7,800-sq.-ft. of immersive brand experiences delivered through a mix of digital and analog experiences, but also through “attraction retail.” The sensory experience begins outside with a state-of-the-art, 91-ft. digital billboard, soaring 10 stories above Times Square. Once inside, the fun really begins. 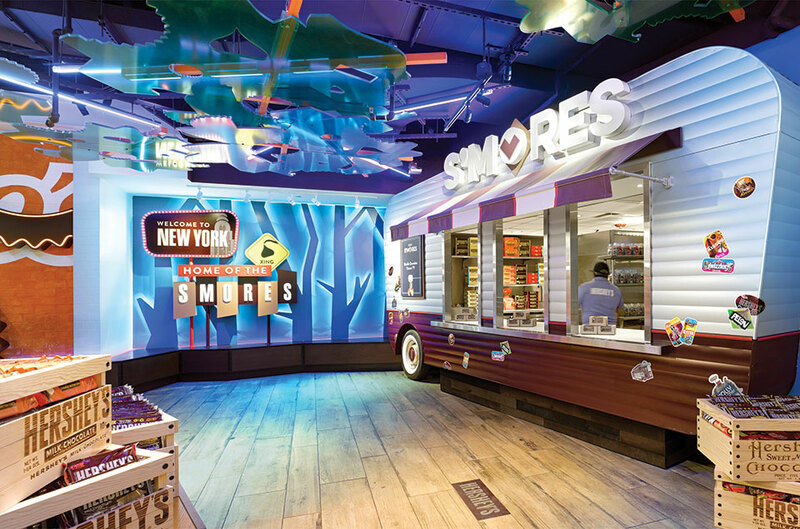 In partnership with The Culinary Institute of America, the Hershey’s Kitchens Bakery features an innovative prepared food, beverage and bakery concept. There’s also the Amazing Candy Machine that dispenses a variety of candy into decorative boxes and the Sweet Personalization, which allows customers to personalize their own chocolate bar wrapper. All of which solidifies Hershey’s Chocolate World as a landmark destination for confectionery lovers. 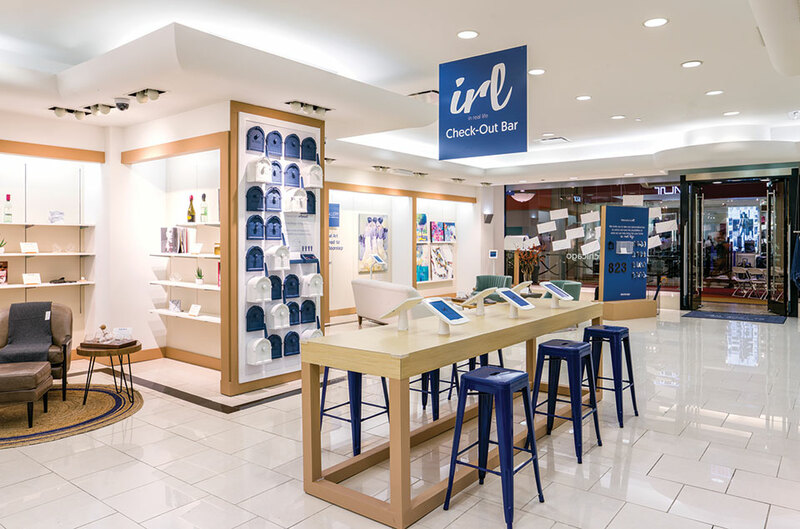 Pioneered by The Lionesque Group and real estate operator GGP Inc., IRL (short for In Real Life) at Water Tower Place in Chicago brings interactive and RFID technology front and center. 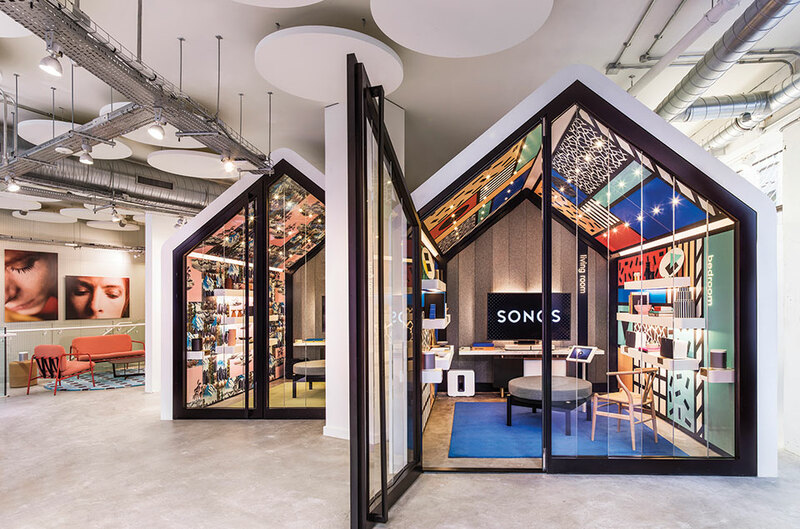 The hybrid, brick-and-mortar store hosts rotating collections of digitally native brands and organizes them around themes (homes and winter holidays). Loaded with RFID software, the 4,000-sq.-ft. living lab brings together customers and e-commerce brands, which gain insight into customer activity, preferences and purchases. The store doesn’t stock products, but digital displays are scattered throughout where customers can learn more about the companies and their items and ultimately place orders for drop-shipping. IRL not only challenges the role of the physical store, but also is reviving the traditional concept of a mall. It’s hard to believe, but earlier this year Nordstrom opened its first full-line store in Manhattan—and for the twist, it’s also the retailer’s first-ever standalone men’s store. 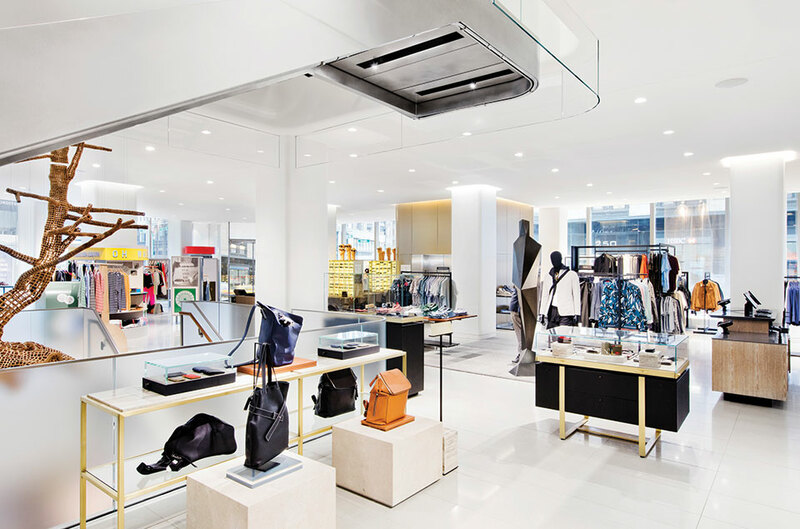 At the intersection of Broadway and 57th Street, the store is a three-level, 47,000-sq.-ft. emporium that screams cool factors and offers easy shopping with its open, flexible floor plan and all-glass façade that floods the clothing racks with natural light. There’s a clubhouse serving handcrafted cocktails, a coffee bar and a floating, diaphanous tree sculpture, suspended in the center of the three-story glass atrium and staircase. It doesn’t disappoint in the clothing department either, with designer shops from Calvin Klein, Balenciaga, Valentino and Dior, custom design embroidery services at the Levi’s Tailor Shop, and an Eton Endless Aisle kiosk for ordering dress shirts. Personal digital experiences are also emphasized at the store with Express Return kiosks at every store entrance and 24-hour BOPIS. Who knew a convenience store could inspire? At 9,200 sq. 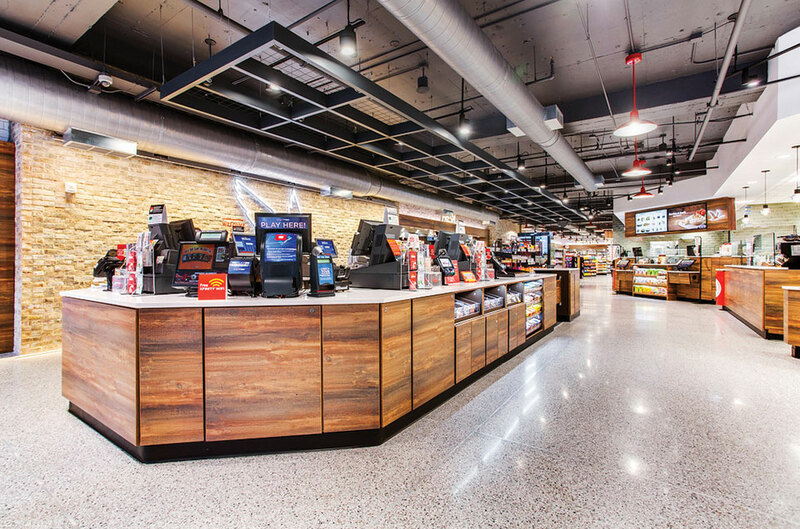 ft., Washington, D.C.’s Wawa is not only the largest Wawa, but its interior and digital features also outshine any traditional gas station shop. With an upscale urban feel achieved through exposed bricks, subway tiles and wood tones, the flagship, near Dupont Circle, is far from the norm. There is custom interior and patio seating where guests can enjoy a Shorti (a Food & Wine magazine-approved hoagie). The tech game also is impressive with large interactive screens, a digital touchscreen display and free Wi-Fi. But perhaps the most unique element is that this convenience store does not have a gas station.